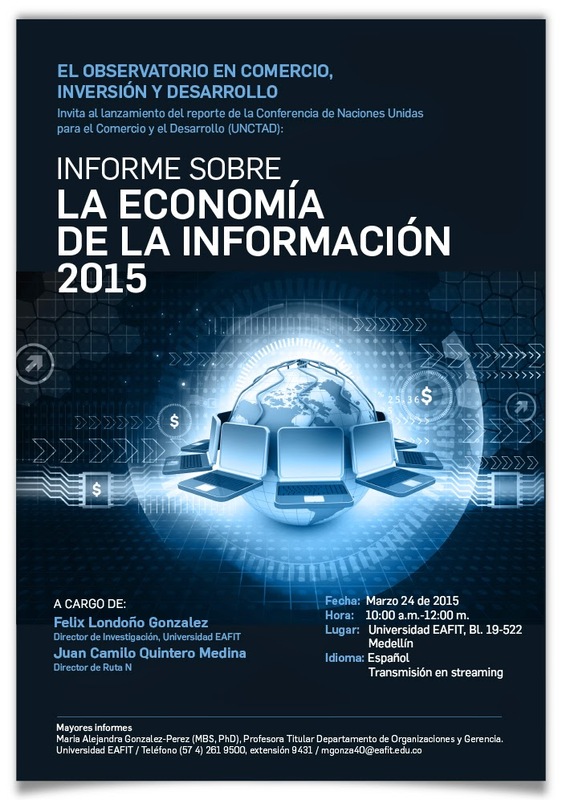 El 24 de marzo se realizó en la Universidad EAFIT el lanzamiento del Informe sobre Economía de laInformación 2015 de la Conferencia de las Naciones Unidas sobre Comercio y Desarrollo, UNCTAD. El evento contó con la presencia de David Sierra, Gerente del Pacto por la Innovación Medellinnovation de la Corporación Ruta N, quien dio a conocer los esfuerzos que esta institución realiza para la consolidación de Medellín como hub de la innovación en América latina. El informe fue presentado por el Dr. Félix Londoño González, Director de Investigación de la Universidad EAFIT. El Informe sobreEconomía de la Información 2015 muestra el proceso de crecimiento de las actividades de comercio electrónico en de la economía mundial. En este análisis, la UNCTAD hace énfasis en la oportunidad que este tipo de comercio representa para los diferentes países, especialmente para las economías en desarrollo puesto que es un mecanismo útil para el logro de enlazamientos en las cadenas globales de valor. De acuerdo a la presentación del Dr. Londoño, el comercio electrónico tienen grandes beneficios potenciales para las cadenas globales de valor, aumentan el alcance y acceso a mercados y mejora la eficiencia de los mercados internacionales y disminuye los costos de las transacciones. Por otro lado, las pequeñas y medianas empresas son otros actores económicos que se pueden ver altamente beneficiados por el comercio en línea. Gracias al aumento de la conectividad, las nuevas aplicaciones que disminuyen las barreras al comercio y las nuevas formas de pago pueden transformar las relaciones tradicionales entre los consumidores y las empresas para hacerlas más eficientes y provechosas. Tradicionalmente, el uso del comercio electrónico fue durante exclusivo de grandes empresas en países desarrollados. En la actualidad, los países en desarrollo también acceden a los beneficios que este trae; no obstante aún hacen falta esfuerzos por parte de los gobiernos en cuanto a la infraestructura legal y tecnológica necesarias para el máximo aprovechamiento del e-commerce. La invitación que realiza la UNCTAD es a ver el creciente fenómeno del comercio internacional no sólo como una oportunidad para promover el comercio y reducir los costos de las transacciones internacionales, sino como un mecanismo útil para los gobiernos y el sector privado para aumentar los niveles de desarrollo en los diferentes países. From March 23rd to 27th 2015, governments will meet again to negotiate the sustainable development goals and target before the adoption of the new development agenda during the United Nations Summit in September 25th 2015.With this in mind, the concept of Public Private Partnerships (PPPs) is presented as an instrument for financing the Post 2015 Agenda for Sustainable Development. The concept of Public Private Partnerships (PPPs) has been around for decades and there are more than a few ways of defining it. On the one hand Stadtler & Probst (2015) present the following definition, “International organizations partnership with businesses and actors from the public and civil society sectors to closely work together to solve a problem or issue of mutual concern that is identified with a public policy agenda item and agree to share risk, responsibilities, contributions and benefits”. On the other hand, Tulder & Pfisrterer (2008) defined Public Private Partnerships “as a process in which partners commit to long-term, structural interaction based on a shared analysis that every actor suffers from a number of failures, consequently a shared vision of sustainability and a shared ambition that all partners should play a role in its achievement” (p.8). Public and private actors are driven to collaborate in order to raise awareness, set standards, provide services and products, use technology, get access and share knowledge (Stadtler & Probst, 2015). For a long period of time governments, business and civil society have had their own unilateral agendas to tackle global development. However, issues like: the complexity of societal challenges, the restriction of resources, ongoing global processes and the rising power of companies and civil society, have questioned the effectiveness of actors working alone (Stadtler & Probst, 2015). But, collaboration is not as simple as it sounds; there are weaknesses that have to be taken into consideration before jumping into new PPPs. For example: potential conflicts of interest and symmetric power relations, undermining organizations interest, exclusiveness, weak accountability and governance structures (Stadtler and Probst, 2015). Let me exemplify this idea by saying that even with the risks involved, engaging in Public Private Partnerships can bring benefits for all the parties involve. The state has more access to resources while increasing leverage of actions. Business gains legitimacy, efficiency, stability and growth. Civil Society achieves direct support for the cause while gaining visibility and leverage. And last, Governments have access to additional resources and innovative approaches for dealing with development (Stadtler & Gilbert Probst, 2015). Many lessons were learned in the past years as the international community worked together towards achieving the Millennium Development Goals (MDGs). As stated by the UN Secretary General Ban Ki-moon in the Innovating for a Brighter Future Report (2010), “The MDGs have sparked a remarkable, global mobilization. Rarely have so many organizations—from the global to the grass roots—agreed on a common agenda. Rarely have so many individuals – citizens and CEOs, philanthropist and political leaders—found such common ground” (United Nations Global Compact, 2010, p.4). MDGs are a set of eight ambitious international development goals that were adopted by UN members in the year 2000 during the Millennium Summit. 2015 was the year set to achieve the goals and spite of the efforts made by states some of the goals have not delivered the expected results, including number eight which is the development of a global partnership for development. According to the renewed global partnership for development report, MDG 8 had gaps and systematic shortcomings and it has perpetuated a donor- recipient type of relationship, which brings up the question of whether the partnership model did not take into consideration the importance of mobilizing development financing other than aid (UN System Task Team on the Post 2015 UN Development Agenda, 2013). What we are mainly concern with here is that even though financial aid remains an important source of development finance, it usually does not increase the capacity for developing countries to mobilized domestic resources, incentivize good governance and implement strategies against capital flight (United Nations, 2013). Whereas there are grounds for believing that PPPs with clear purposes that incorporate market transactions frameworks with public policies for operation, advocacy and resource mobilization, knowledge transfer and accountably for transparent information can have long term effects in social and economic development. In Public Private Partnerships, international organization like the United Nations should help create the rules, define the standards while acting as a partner, an initiator and a facilitator. (Stadtler & Probst, 2015). One of the largest and most successful global partnership initiatives is the United Nations Global Compact. The two main objectives are: mainstreaming the UN Global Compact´s ten principles in business activities around the world and catalyzing actions in support of broader UN goals, including development goals. Furthermore, this initiative encourages responsible business practices based on the protection of human rights, labor, and the environment and also work to eliminate corruption (United Nations Global Compact, 2010). The Global Compact initiative was launch in the year 2000 and currently has more than 12,000 participants; over 8,000 of them are businesses from approximately 145 countries around the world (Fundation for the Global Compact, 2015). Even though becoming part of the Global Compact is voluntary, members adapt these principals to the governance strategies in order to contribute to social and economic development. Businesses have the advantages of being closer to the people and working around local constrains in ways that government, and civil society cannot (United National Global Compact, 2010). Additionally, they have the knowledge for the production and marketing of goods and services (Stadtler & Probst, 2015). But simply doing business to earn the greatest possible profits in the shortest amount of time is not enough (United National Global Compact, 2010). Corporate Social Responsibility (CSR) and the acknowledgment that business and development often overlap, has placed companies in the center of the challenge to raise living standards in developing economies. Businesses have the responsibility to incorporate new business models taking under consideration societal needs while generating long term sustainable investments. A concept proposed by Harvard Professors Michael Porter and Mark Kramer (2011) known as Shared Value, states that if companies want to solve development problems through business models that create value for both the shareholders and society. They must re conceive products and markets by finding innovative ways to increase productivity in the value chain, making it more efficient in the use of resources, labor and suppliers and also, enabling local cluster development by setting PPPs in their business environment (Porter & Kramer 2011). This concept attempts to go beyond the idea of social responsibility by connecting companies’ success with societal improvement, through a new approach to traditional capitalism (Porter & Kramer, 2011). National and local governments play a vital role in setting the right environment for financing sustainable development. According to the report Innovative Public Private Partnerships for Inclusive Development in Latin America, “(...) governments are responsible for designing, fostering and implementing social covenants, regulatory frameworks, incentives, policies and innovative partnerships with the private sector and civil society, the economy and the productive sector within rights based approach.” (World Economic Forum, 2014, p.12). In order to facilitate the exercise of citizenship in all its dimensions, a new agenda incorporates coherent economic and productive development policies while working towards universal employment with full rights, universal social protection and capacity building (WEF, 2014). Also, a political legitimized state is capable of achieving long term goals and the coordination of economic and social agents (WEF, 2014). In order to gain political legitimacy governments are responsible for being transparent while implementing strategies for good governance. Good governance is a concept that applies to all agents participating in PPPs. Governments should take citizens demands into account when formulating new policies, provide goods and services efficiently and effectively, should not let those who are providing the services pocket the money, and last but not least, it should regulate the outcomes and enforce its laws and decisions fairly, efficiently and without bias and favor (Griffin, 2015). All these aspects are fundamental in order to develop new PPPs for financing development. In recent years Civil Society actors have become important stakeholders in the analysis and debate of financing sustainable development, the environment and the rights of the most vulnerable sector of society. Through data and information access these actors have become better informed, organized and relevant in formulating and implementing concrete initiatives addressing economic, social and cultural rights based issues (WEF, 2014). Civil society is responsible for the inclusion of social concerns on the public national and international agenda, to advocate for transparency, good governance and responsible practices by both governments and business (Griffin, 2015). “Civil society should also be in charge of the development of strong partnerships with academia and donor institutions, hence reflecting the growing awareness of citizens and societies as a whole of their rights and responsibilities regarding sustainable development” (World Economic Forum, 2014, pg.12). Case studies from NGO´s like AVINA in South America, suggest that organized communities can be empowered and are demanding to the lead in both the design and implementation of programs and potential PPPs. AVINA works towards the objective of creating favorable conditions for diverse actors to join forces in contributing to the common good. They select their opportunities based on their relevance for sustainable development, their potential for the regional and global scalability (AVINA, 2015). To sum up, joint efforts from the United Nations, business, states and civil society are fundamental for developing strategies that contribute to effective long lasting Public Private Partnerships to tackle the challenge of financing the United Nations Post 2015 Sustainable Development Agenda. There has been important advancements and lessons learned from the outcomes of partnerships developed to achieve the Millennium Development Goals. However, the future development challenges that we face require dynamic and committed actors that can come up new innovative ways to develop PPPs that go beyond their own interest but that at the same can benefit their stakeholders. International organizations like the United Nations have the role of bringing parties together and foster collaborative approaches that include universal commitments calling for actions from all actors according to their capabilities. Businesses are now at the center of the debate as the traditional profit oriented models of production are being questioned. They must understand that their contribution to development is fundamental and is not only good for the people in their communities but also for them, in order words if there is prosperity in the communities in which they operate, it is likely their business and shareholders will also benefit from it. Governments must create and enable the right environment for financing development taking into consideration multi stake holder partnerships and creating strategies for mutual accountability and good governance. Also, setting up policy frameworks for PPPs in order to increase the effectiveness and efficiency of development assistance and go beyond traditional donors. This will allow developing countries to build capacity and to find other means of mobilizing domestic resources. Civil society should continue to oversee the processes of the agents involve in PPPs while contributing to national and local agendas for development. Their role is essential when it comes to identifying bad governance and corruption within institutions. In the end, we are all accountable for the global challenges that we face, and if we work together and implement innovative strategies to renew public private partnership, it is reasonable to think that financing the United Nations Post 2015 Sustainable Development Agenda is possible. Griffiths, R. (2015). Video lecture # 5: Govenance. Retrived from Coursera Challenges in Global Affairs Specialization Course. Michael, P., & Kramer, M. (2011). Creating Shared Value. Harvard Business Review, 2-15. Stadtler, L. & Probst, G. (2015) Video lecture # 1: why and how do International organizations engage in public-private partnerships?. Retrived from Coursera Challenges in Global Affairs Specialization Course. Stadtler, L. & Probst, G. (2015) Video lecture # 2: what are the challenges and opportunities in PPPs?. Retrived from Coursera Challenges in Global Affairs Specialization Course. Stadtler, L. & Probst, G. (2015) Video lecture # 4: What does partnering in PPPs imply forthe International Organization?. Retrived from Coursera Challenges in Global Affairs Specialization Course. United National Global Compact. (2010). Innovating for a Brighter Future- The Role of Business in Achieving the MDGs. New York: UN Global Compact Office and Dlaberg Global Development Advisors. United Nations. (2013). A Renewed Global Partnership for Development. New York: UN. United Nations Task Team on the Post 2015 UN Development Agenda. (2013). Financing for sustainable development in the global partnership beyond 2015. New York: UN. World Bank. (2012). The cost of attaining the Millennium Development Goals. Washington D.C.: Work Bank Group. World Bank. (2013). Financing for Development Post - 2015. Washington D.C.: Work Bank Group. World Economic Forum. (2014). Creating New Models: Innovative Public- Private Partnerships for Inclusive Development in Latin America. Geneva, Switzerland: World Economic Forum. El instituto virtual de la Conferencia de las Naciones Unidas para el Comercio y el Desarrollo (UNCTAD) y la Universidad EAFIT los invitan al lanzamiento mundial del informe sobre la economía de la información. La presentación oficial para Colombia estará a cargo del Dr. Felix Londoño González* (Director de Investigación de la Universidad EAFIT), y Juan Camilo Quintero Medina (Director de Ruta N). *Felix Londoño Gonzalez es el Director de Investigación de la Universidad EAFIT. 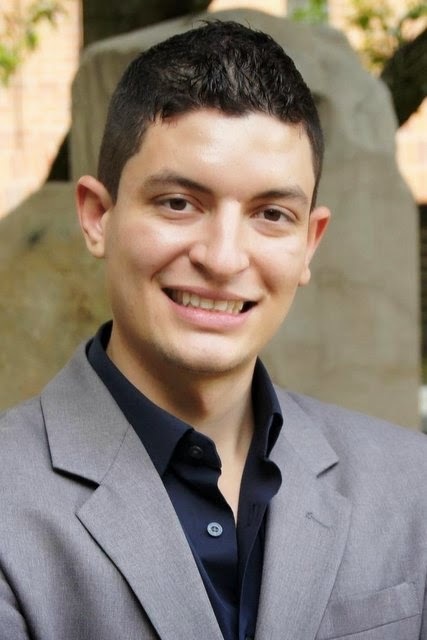 Es PhD en Ingeniería Eléctrica y Computacional, y Magister en Ciencias de la Computación de la Universidad de West Virginia en los Estados Unidos. En el año 2014, fue reconocido por los investigadores de la Universidad EAFIT por su liderazgo al desarrollo y posicionamiento de la universidad en cuanto a investigación científica y formativa. También de la Universidad de Antioquia fue reconocido en 1996 por Escritura Pública. Ha dirigido numerosas tesis de Maestría, y ha sido ponente en diversos eventos científicos nacionales e internacionales. El Doctor Londoño González ha sido delegado por la Conferencia de las Naciones Unidas para el Comercio y el Desarrollo (Unctad) para el lanzamiento oficial para Colombia de los reportes anuales sobre la Economía de la Información en los años 2010, 2011, 2012, y el dia de hoy para el lanzamiento de la versión 2015.